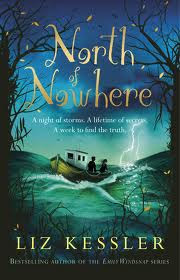 I accepted North of Nowhere for review mostly because it was written by Liz Kessler who you might recognize as being the author of the Emily Windsnap series. I read The Tail of Emily Windsnap (linked to my review) back in 2008 and discussed it over at 5 Minutes for Books. (It is a post that is still discovered online by teen girls who leave comments letting me know how much they loved the Windsnap books!) I rather liked that one myself, with cautions and reservations. I did think Kessler told a good story though and that raised my interest for North of Nowhere . In this new title, Liz Kessler explores some of the "what if?" questions of time travel. In certain respects, North of Nowhere reminds me a great deal of When You Reach Me (linked to review). If you like one, you are almost sure to like the other. North of Nowhere opens with an introduction to the main character Amelia, or "Mia" for short. She is just about to begin her Spring Break when her mother announces to her that instead of spending time at the mall hanging out with her friends, she would be joining her mother on a visit to her grandparent who live in a podunk seaside town. Mia is angry about this change of plans until she is made aware of the reason behind it: her grandfather has mysteriously disappeared. Mia and her mother make the trek to her grandmother's and the search continues for the whereabouts of Mia's grandfather. Bored, Mia wanders down to the shoreline and there finds an abandoned boat with a diary inside. She opens the diary and begins reading the secret thoughts of "D." Mia feels bad for reading "D's" diary and decides to be honest about her infraction and writes a quick confession inside the diary for D to find. The boat then disappears for the evening, reappearing the next morning with a note from "D" to Mia. An odd friendship is formed through the letters the girls write to each other within the pages of this diary. I don't want to spoil the story at all and there is a risk of it if I continue on with much of a description of the plot line. There is mystery surrounding the identity of "D" and also Mia's grandfather. If you want to know this story, it is best to read it for yourself. Unlike in The Tail of Emily Windsnap, I do not believe Kessler is making any attempts at any political arguments in this story. My only irritation with the book is in the character of Mia who is a bit of a whiny, self-centered teen. However, she does seem to recognize the fact that she has a duty and a responsibility to care for her family members and manages to rise to the occasion. I can't say that I was completely riveted by this book or that it'll go down as one of my favorites, but I will confess to being pleasantly diverted. Kessler has the ability to weave an interesting story and I appreciate that of her. As I say, if you liked When You Reach Me, you'll be interested in North of Nowhere . Better news - Candlewick Press have offered to give away one copy of this title to one of you! Would you care to win? Simply leave a comment below including a valid e-mail address. This contest is open to U.S. Residents only and will be open through Monday, August 12. THIS CONTEST IS NOW CLOSED. THE WINNER, as selected by Random.org, is #1 - Amy at Hope is the Word! Many thanks to Candlewick Press who sent a copy of the above title my direction in exchange for my honest review. Thanks also for offering an additional copy to one of my readers! I loved When You Reach Me, so sign me up! I thought When You Reach Me was fascinating! I'd love to win a copy of this one (or check it out at the library if I don't win). I love reading books about time travel, and this one sounds so good. Please enter me. Thanks!